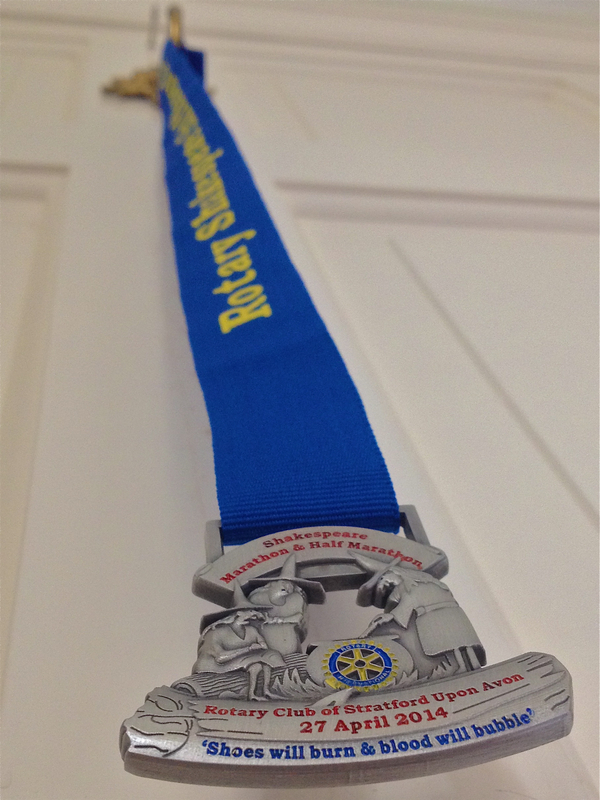 Well, that was highly enjoyable and another excellent effort from the Rotary Club of Stratford-Upon-Avon for this, one of my very favourite half marathons in the running calendar, this year commemorating the would-be 450th birthday of William Shakespeare. Perfect conditions (for the runners at least) prevailed with overcast skies, a light breeze and occasional ‘spits’ of rain, so there could be no complaints for those runners seeking a good time and… a good time. *Unconfirmed officially yet, but there or thereabouts. I’ve not run this course for a few years now and a few things have changed since last I was here. The start has moved to Church street and the finish threw me a little, taking a slightly different route through the park, but still very much the same, enjoyable course around the town and the surrounding, undulating countryside. Firstly, to Tina and Gary Taylor and their very excellent bed and breakfast ‘First-Night’ in Stratford-Upon-Avon. I’ve been staying there for years now and they always go out of their way to make sure everything is just as YOU need it. A 7am breakfast, especially for race day was a lovely touch and above and beyond the call of duty. Thank you Tina! Secondly, a big thanks to Mick and Phil who took pity on this shivering Londoner as I made my way into town early this morning giving me a lift in their van to the race start area. Incidentally, Shakespeare himself crossed the line today in 2 hours, 11 minutes or so, or at least someone dressed in Elizabethan regalia vaguely resembling him did; it was hard to tell though, he had a hat on. John Michael McDonagh’s ‘Calvary’ is a tip of the hat to ‘Father Ted’ and maybe just a little nod of the head to the weird and wonderful ‘League of Gentlemen’ (Aiden Gillen’s character even having a passing resemblance to Reece Shearsmith). Overridingly though, it’s a darkly comic whodunit that examines the apparently decreasing role and relevance of the Catholic church in today’s society, along the way. With the clock ticking down to Father Lavelle’s own personal D-day, we scrutinise a rather bizarre array of odd local characters to identify a would-be killer, each with their own troubles and each with a sneering disdain for the church for one reason or another, yet each with an underlying, deep-rooted need for the compassion and healing that perhaps only spirituality in some form, can provide; more maybe than they realise? Set along the rugged and beautiful, wind-swept coastline of rural Ireland, Calvary is a story of coming to terms with our issues, acceptance and more importantly forgiveness and the fact that, whilst perhaps organised, rule and fear-driven religion is an outdated concept today, many of its sympathetic and poignant teachings remain as relevant as they ever were and ever will be. Everything can be fixed. There’s always a solution… Or is there? ‘Locke’ is the story of how any of us, no matter how in control of our lives we assume we are, can see the whole thing come crashing down around us through just one moment of weakness. None of us are infallible. Tom Hardy expertly portrays Ivan Locke, a highly honourable, dependable and meticulous construction site foreman, battling manfully and methodically, as is his nature, to stay on top of his rapidly crumbling existence, as a catalogue of hellish, personal and professional logistical scenarios unfold, all of his own making. Director Steven Knight has certainly taken a brave stance basing an entire film on just one visible character, a night drive and a series of increasingly desperate phone calls, but it works and does so convincingly. Littered with metaphors, innovative and engaging throughout, Locke is a definite ‘must see’ for me. “An absence of evidence is not evidence of absence” – the words of Donald Rumsfeld, then Defence Secretary to the George W Bush administration in his party’s defence of the WMD issue. ‘Unknown Known’ is an all attention and focus, Errol Morris documentary on Donald Rumsfeld, one of the most influential figures in shaping the last 40 or 50 years of U.S and indeed world politics. I know I certainly had my own personal opinions of the man going into this film and to be honest, nothing has really changed having seen it except perhaps a little grudging respect that this most slippery of super-sharp, career politicians is and has been a master of what he has always done, putting a positive or at least palatable spin on the unpalatable; or should that be, making excuses for the inexcusable? My own opinions aside (formed as much outside of Rumsfeld’s days as the Secretary of Defence as within), how well does this ‘spotlight on one man’ documentary work as a film? Well, it’s cleverly put together in a mostly nonlinear fashion, using interview techniques that probe for answers without ever demanding them, instead attempting to allow Rumsfeld to fall into his own webs of spin, backed up by substantial film and television footage and indeed vast archives of memos and documents that Rumsfeld himself dictated over the entirety of his career. It’s an intriguing spectacle. Perhaps, or more likely it’s a prime example of both political sides being driven by one agenda politics, irrespective of what their illusory political leanings may appear to be. That, I feel is far a far more likely scenario and maybe a lesson in there for those that choose to nit-pick at the minutiae of political policies ignoring the bigger and more obvious political picture. Personally, I’d like to have seen some focus on the man’s heavy corporate, political leanings and affiliations; potentially as damning in many ways as the military-related subject matter, but maybe that’s for another day. Not one to break any box office records this, but a fascinating glimpse nonetheless at a man who’s been up to his neck in the cloak and dagger, shady dealings of U.S and world politics for many a decade.